With the change in seasons, comes a change in my weekly meal plan. During the summer, it's all about grilled dinners, salads, and BLT's. Quick and easy is the name of the game, so we can maximize time for playing outside or walking to the ice cream shop after dinner. Things seem to slow down a bit as the weather cools down, with more time spent inside, cuddled up reading books, watching movies, building train tracks, and simmering pots of soup and chili on the stove top. Oftentimes soup and chili are relegated to the weekend. Because while not difficult or complicated, they can be time-consuming: chop all the veggies, cook the veggies, cook the meat, combine it all, and let it simmer away, marrying together all the flavors and ingredients. Luckily, you're rewarded for your patience when you have lunches for the rest of the week! But sometimes you want soup on a Monday night. Like, hypothetically if all the kids have colds... and one of the babies has an ear infection... and the other baby has a stomach bug... and you just want comfort food. But since you're counting calories, you want something lighter. Hypothetically of course. And you want it right now - not in two hours. Then what? Then you make this soup. 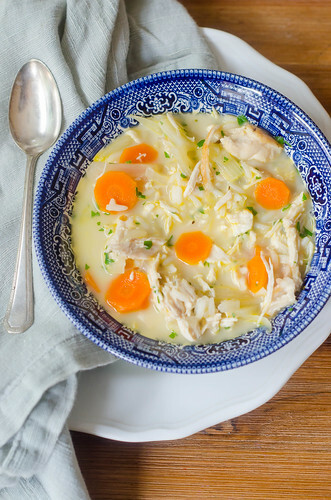 It's a comforting chicken and rice soup, but it's kicked up a little. The combination of onions, carrots, and fennel give it an aromatic base, with just a hint of sweetness. The hearty chicken and rice add bulk, and the lemon and thyme give it a nice freshness. Where this soup really stands out, however, is with the addition of the egg yolks. They give the soup a really smooth, creamy, custardy quality, but without any heavy cream or dairy. This gives the soup richness without being too heavy. It's a great transitional soup from summer to fall - all the comfort and warmth, but with a bright lemony flavor, and right around 300 calories per serving. Heat 1 tablespoon of the oil in a large saucepan or Dutch oven over medium-high heat. Pat the chicken dry and season with salt and pepper. Brown the chicken on both sides, about 5-6 minutes total; transfer to a plate and set aside. Add the remaining tablespoon of oil to the pot, followed by the carrots, fennel, and onion. Cook over medium heat until the vegetables are softened, about 4-5 minutes. Stir in the garlic,thyme, and 1/2 teaspoon of salt, and cook until fragrant, about 30 seconds. Stir in the broth and lemon zest, and use a wooden spoon to scrape up any browned bits on the bottom of the pan. Immerse the browned chicken in the broth, and bring to a simmer. Simmer until the chicken is cooked through and reaches 160 degrees Fahrenheit on an instant-read thermometer, about 10 minutes. Remove the pot from the heat and transfer the chicken to a cutting board, and when it's cool enough to handle, shred into bite-sized pieces. Fish out the lemon zest from the pot. Stir in the shredded chicken and rice, and return the soup to a simmer. Allow to simmer about 1 minute, then turn the heat to low. Meanwhile, whisk the egg yolks and lemon juice tighter in a medium bowl. Stir 3 tablespoons of the hot broth into the yolk mixture, then whisk the yolk mixture into the soup. Continue to cook the soup gently, whisking constantly, until it thickens slightly, about 1 minute. Immediately remove from heat and stir in the parsley. Taste and season with salt and pepper to taste. Serve immediately. I'm sorry to hear about all the sickness!! Hopefully this hearty soup made you all better. This is really great in winter days. I love it! I have been meaning to make a soup with egg yoke as a thickener, I will have to try! And bless you, having sick children is hard - all of mine had a horrible cold and stomach bug for the past 10 days, no fun! I hope everyone is feeling better! I can make this soup for my wife who had a cold. This will make her feel more better.